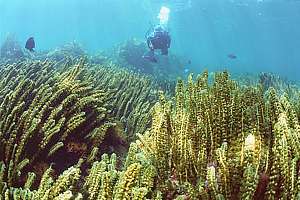 New Zealand has a very high diversity in sea weeds, and the Poor Knights has its share with those preferring clean water with relatively low nutrient concentrations. The temperature also does not drop much below 15ºC. 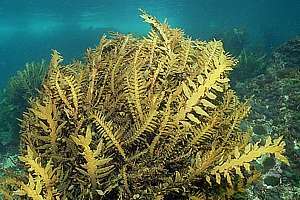 For more about seaweeds, visit our rocky shore section. 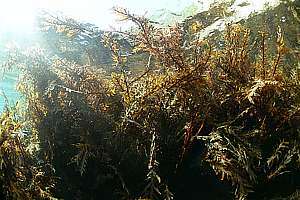 The brown seaweeds are the major colonisers of the shore. They are robust, adapted to wave action and UV light, and they are large and dominant. There are two main varieties: the bladder wracks that are stringy, held upright by float bladders, and those that have stems connecting with large blades. 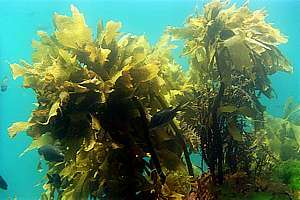 In near-coastal environments, the bladder wracks dominate the wave zone, but here at the Poor Knights, the beautiful strap kelp (Lessonia variegata) can be dominant in the barren zone which is normally grazed by sea urchins. The reasons for this are poorly understood but could relate to the high wave action that sweeps sea urchins clear from their zone, and the inedible low branches of the strap weed. 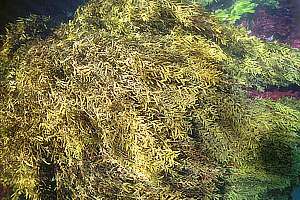 f028417: the strongest sea weed is the golden wrack or wire wrack (Carpophyllum angustifolium) which has wiry stems that a man cannot break, and small leaves. Where heavily exposed, it doesn't bother making float bladders. 0701117: during a calm low tide, the golden wrack zone falls dry, as in this photo. 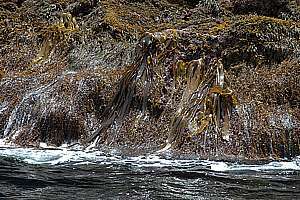 Bull kelp (Durvillea antarctica) can now clearly be seen, with its long tapered fronds. 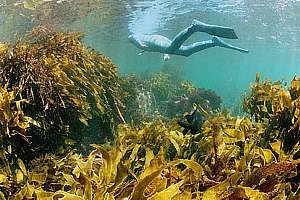 Bull kelp does not belong to Northland's east coast, but is encountered here and there. f051111: the second in the strength contest is the flapjack (Carpophyllum maschalocarpum) which grows direct underneath the wire weed, or at the top of the shore where waves are less violent. The flapjack has flat stems and pointed leaves. f034324: flapjack growing bushy in more sheltered conditions. f048622: the long-leafed zigzag weed (Cystophora sp.) is surprisingly common on the wave-exposed side of the Poor Knights. f046032: the featherweed (Carpophyllum plumosum) is found in sheltered places. Here a stand of featherweed has lost its finely branched leaves, perhaps by being grazed. f048309: the weakest of the bladderweeds is the flexible or tangle wrack (C. flexuosum) which is found in the most sheltered conditions. 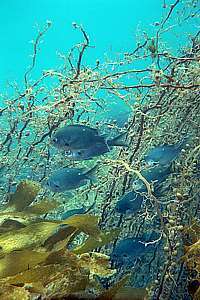 But here it can grow 6m tall, forming true undersea forests. f033912: this is the normal look of featherweed (Carpophyllum plumosum), as the plants look indeed like feathers, with their small float bladders and finely forked leaves. f009809: the tall and open featherweed stands offer ideal protection to small fish like demoiselles, from marauding attacks by diving gannets and shags. 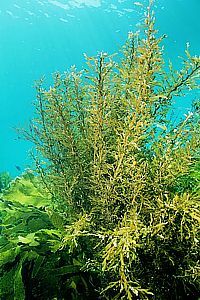 f012821: the stalked kelp (Ecklonia radiata) is New Zealand's' most dominant sea weed. It has a tall stalk on which it carries a proud crown of large leaves. 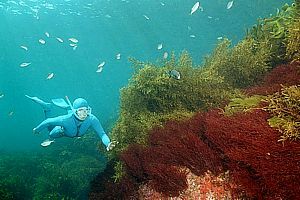 f041534: a snorkeldiver swims over a dense stand of shallow stalked kelp. The photo does not do justice to the brilliance of this environment. 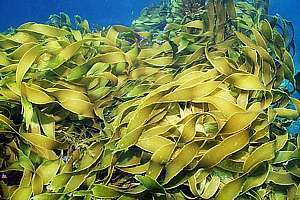 f012736: the strap kelp (Lessonia variegata) wins the contest for grace and beauty, its straplike leaves forever waving in the wavewash, bright yellow-green. 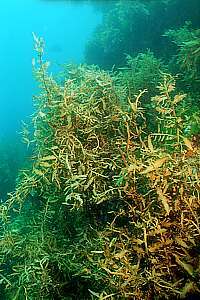 f048613: the strap kelp Lessonia sprouts from a forest of branching stems that are so tough that sea urchins cannot bite through. 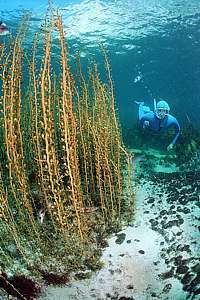 f048601: a very mature stand of strap kelp (Lessonia variegata). f012618: in some areas, particularly on submerged pinnacles, the strap kelp can be the dominant plant cover. 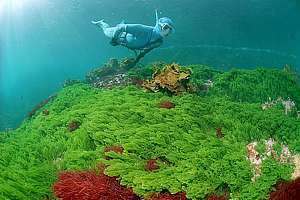 The green seaweeds provide much of the food of algal grazers like sea urchins and black angelfish. 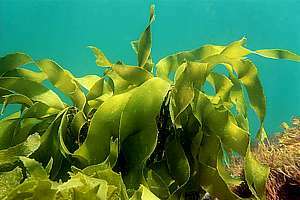 f051525: the green sea lettuce (Ulva lactuca) is very edible and is usually grazed down to a fine lawn. When it appears like this, in the barren urchin zone, it means that the grazers are no longer there. f042627: sea rimu (Caulerpa brownii) grows on a running root (stolon) and its leaves look a bit like those of the rimu tree. It too is normally grazed down to a short carpet. 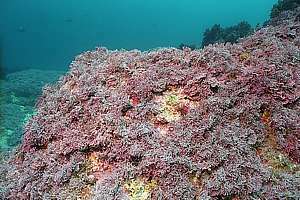 The red seaweeds are not dominant zone builders, but fill niches here and there. Most are edible and eaten by grazers like sea urchins, but also by pelagic fish when zooplankton is scarce. 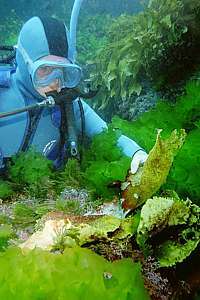 f048627: the fretsaw weed (Vidalia colensoi, Osmundaria c.) is perhaps the toughest red seaweed, here seen growing just under the golden wrack in the wave zone. f051211: close-up of the fretsaw weed (Vidalia colensoi, Osmundaria c.) shows its narrow serrated leaves. 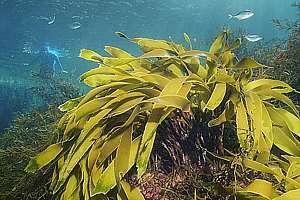 Unlike other seaweeds, the fretsaw weed does not feel slimy. It is not edible either. 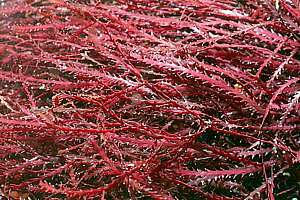 f051729: most red seaweeds are fragile, finely branching varieties as shown here. In the background (Plocamium costatum) and in the foreground Melanthalia abscissa. f025307: some red seaweeds look brownish or even greenish like this gigartina species, which is also remarkably tough. 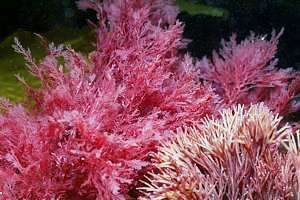 Calcareous algae make leaves that are as hard as limestone, because they are made of it, infused with red plant matter. 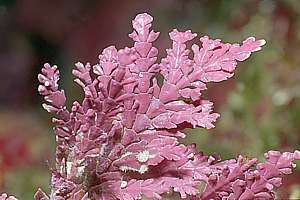 The most important reef builder and zone builder is the pink paint (Lithothamnion), which grows flat over the rock in sheets made of single leaves. 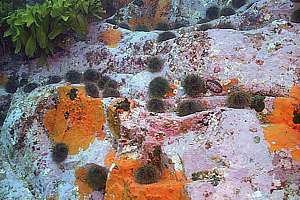 Wherever urchins graze, the rock will soon be covered in pink paint. 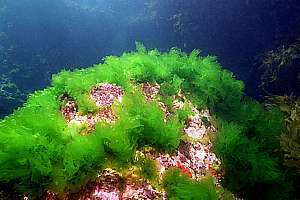 Calcareous algae can grow bushy, forming a turf like cover. Each stone plant consists of tiny leaves made of a single pebble of limestone, hinged together by very tough hinges. 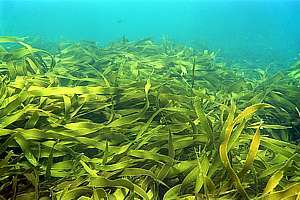 In places where no other seaweed can grow because of intolerable wave action, these calcarious turfs dare to survive, occupying the barren zone. f051801: the whole rock face is covered in pink paint (Lithothamnion sp), which is not damaged by the grazing teeth of sea urchins. An orange carpet sponge (Crella incrustans) also survives, because it can quickly repair itself. Photo not taken at Poor Knights. f051822: the barren zone has been occupied by pink paint, seen in open patches, covered by turfing coralline algae. f035721: detail of pink paint leaves (Lithothamnion sp), competing for space. 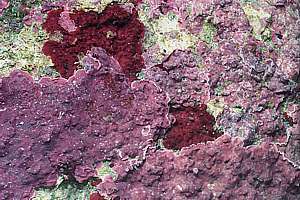 The dark red patches are also an encrusting alga but not coralline (blood crust). f049715: detail of a coralline alga, showing individual leaf 'pebbles' joined by tough hinges.